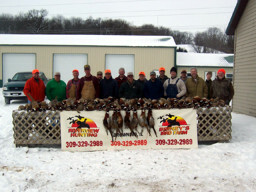 Riverview Hunting is a hunting operation developed out of necessity. The hunting industry needed a better Euroshoot in the mid-west, one that is timely on operations, increases the challenge of the shoot, and decreases the harvest rate. A Euroshoot that makes accessibility a foremost priority for all ages of shooters and increases the variety of shots with each movement to a new station. 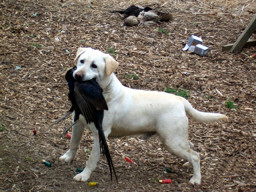 Incorporating top quality guides and dogs, we have a very knowlegeable staff that can conduct a hunt in any and all weather conditions and that will exceed customers' exspectations. At Riverview, European style hunting is our specialty. What is Euro-style shooting? Most avid shooters know it was developed in Europe as driven shooting. Beaters drive the birds out of fields off higher points of land, the birds then fly out over the guns at a high rate of speed and distance. 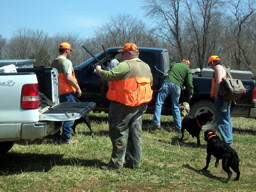 The shooters are placed at stations around the driven area and dog handlers are then placed with shooters for retrieving down birds. Now this may seem very easy for a good shooter, but at Riverview we developed this into a circle with a wide variety of different shots. 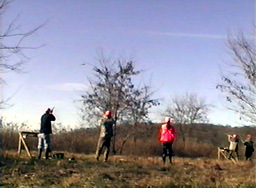 For example: incoming, over the head straight up (40-90yds), timber-hole shots, and field or over decoy shots. Dog handlers are placed around for the retrieval of downed birds. For your convenience ATV's are available for assistants with walking, guns, shell, ect. 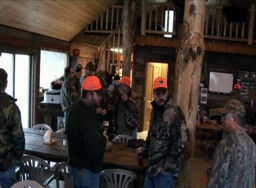 Our goal is to get you in here to experience a whole hunting season of shots and shooting along with 31 other guns. Once we get you through our doors we'll keep you as a customer. Where else can you go and shoot 4 to 6 boxes of shells, eat, BS, take home all the memories and still be home by dark, all in about two or three hours. The newest shoot at Riverview is our "FLURRY". An offspring of the Euro-shoot, the flurry is built for 2, 3, or 4 guns. It can be shot Tuesday thru Fridays and it comes with a meal and bird cleaning. 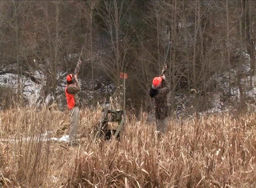 You can choose pheasant or chukar or any combination, and it comes in three different bird release numbers of 10, 15, or 20 per gun. The flurry is very fast pace shooting at the beginning topped off with a very relaxed field and pointing hunt behind some of the best pointers around. The "FLURRY" takes approximately 20 minutes to shoot a box of shells with a small break for a snack and something to drink. Meanwhile, handlers retrieve downed birds while another guide will be preparing the pointers to take the group to the field. Finish off at our clubhouse with a light meal and the birds will be cleaned and ready for you when you leave. Bang for your buck, this is our best choice. You'll shoot 1-2 boxes of shells (lead can be used on the Flurry), you'll harvest whatever your shooting ability allows you to. It is a quick, simple format. It's fast, slow, has dog work, standing, walking, large variety of shots, all in a reasonable amount of time (approximately 3 hours). Great for a weekday hunt, mornings are best. Briney's Bird Farm was started in 1990, as a hobby, with the production of 100 pheasant and 100 quail. It then grew to be one of the largest farms in IL and one of the largest in the United States. 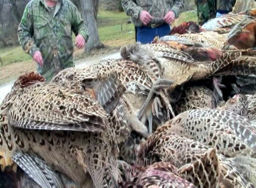 We now produce Chinese Ringneck Pheasant, Kansas Blueback Pheasant, Melanistic Mutant Pheasant, and Chukar Redleg Partridge. We deliver product throughout the Midwest to clubs and private individuals. Quality genetics, management, and service is the heart of our business and is the reason why we continue to progress and grow. Give us a call to discuss the right bird and the right time-frame to meet your operation's needs. Copyright © 2019 Riverview Hunting / Briney's Bird Farm. Portions copyright © 2019 Logonix Corporation.